As part of it’s campaign to raise awareness of hate crime the 17-24-30 No to Hate Crime Campaign in partnership with Stop Hate UK have set up a google map to promote Hate Crime Awareness events that Councils, Police Services, partners and communities affected by Hate Crime are organising around the UK. The week takes place in October, starting on the second Saturday of the month with a service at St Paul’s Cathedral and ending on the third Saturday of the month with a series of Hope and Remembrance vigils that will take place around the UK and abroad to mark International Day of Hope and Remembrance for those affected by hate crime. 2015 Week begins on the 10th October and ends on the 17th October. 2016 Week begins on the 8th October and ends on the 15th October. Once 17-24-30 receive this information they will share it with Stop Hate UK so that it can be posted on both this 17-24-30 WordPress site and the Stop Hate UK website. 17-24-30 will then add an event marker (using the postcode given) on the google map and add information about the event to the location box (which appears when you click on the event markers). 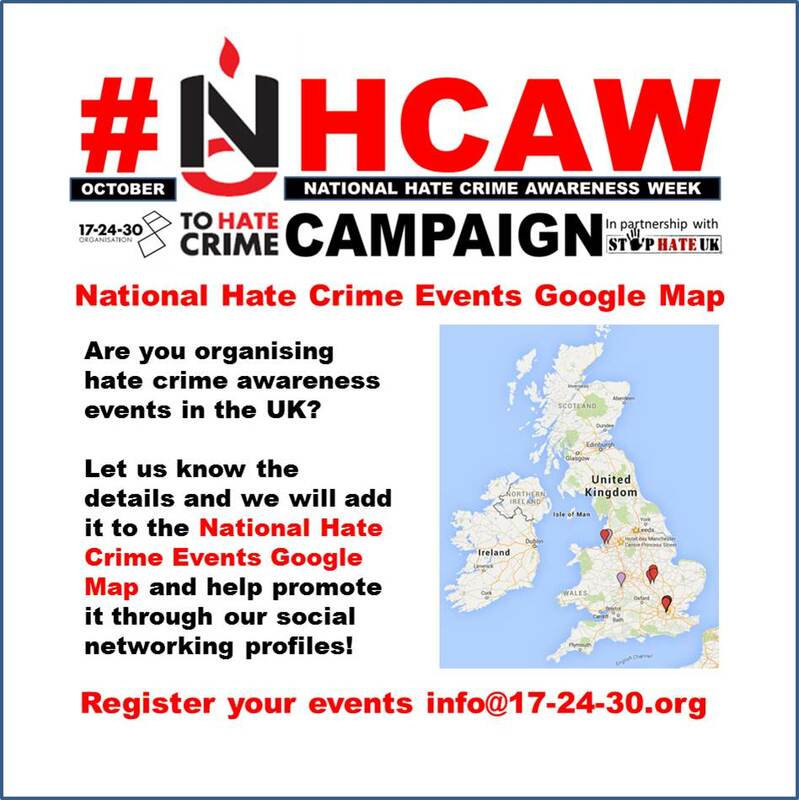 As Google Maps is not accessible to people with visual impairments we will also add details of the event to an event listing which will be located on our Hate Crime Awareness Events Google Map page. There are plenty of ways people got involved last year. Candlelit vigils were held across the country, including London, Sussex, Devon, Suffolk and Berkshire. Last year we were overwhelmed with the amount of support, and would like to thank everybody for their letters and statements, including Stop Hate UK Patron, Baroness Lawrence, Prime Minister David Cameron, Deputy Prime Minister Nick Clegg and leader of the opposition Ed Miliband. We have also received letters of support from the Mayor of London, Boris Johnson and the Minister for Crime prevention Norman Baker MP. Our thanks also go out to all those who were involved in planning and attending events across the country, and for those who organised and stood vigil to remember all those affected by Hate. We are already starting to plan for 2016 so mark the 8th October to the 15th October 2016 in your diaries now!